I saw this as one of the hero images on the microsoft.com home page. A hero image is a really big photo or ad that takes up a lot of space on a web page. I was intrigued by the message. I have several thoughts when I read that tag line but I won’t get in to them here. I realized there was an opportunity to help instead of just trashing, so I created this to replace it. Please be gentle in your evaluation and feedback. I am but a lowly software developer with an idea. Scott Guthrie, a man I deeply respect because of his technical chops, his dedication to his products, and his dedication to Microsoft stack developers, posted a blog about Azure which I have linked to below. My feedback here is not about anything technical that Scott discusses in this post. It’s about confusion and inconsistency. It’s about the screen captures in Scott Guthrie’s post. If you look at the screen shots, only two out of ten follow the same creative direction (for those who are counting, these are “virtual machines” and “web sites”). Why is it so hard for a company with the resources of Microsoft to deliver a unified, consistent experience? By asking the question, I wonder if I’ve discovered the answer. It’s not about money. It’s about taste. How do I know what will be in ALL CAPS versus what won’t? What will be white text on a dark gray background versus white text on a blue background versus black text on a light blue background versus blue text on a white background? How do I know what really huge white text on a black background means in comparison to generally-accepted “large” text on a white background? How do I know how a gray tile with a tiny little white icon in the upper left corner is more or less important than a blue tile with a larger icon? How do I know why “PHP” is purple but “.NET” and “other” are both blue? Do these purple and blue colors carry through to anything besides the one screen that The Gu captures here in his post? I’m not saying anything specific is better than what Microsoft has done here in the screen shots that Scott has included in his post. I’m just saying that I’m confused. There is no consistency in the user experience here. There is no unified creative vision that I can determine. In this case, the users are theoretically quite technical in nature, but in my opinion that makes them no less valuable than John Q. Public. By now many people have seen the Windows 8 preview video and I’ve read several comments about it on Facebook, Twitter, and many other sites. I watched the video too. And I was impressed to see the different type of thinking that was happening up in Redmond – right up until the 3:06 mark where they finally show that all of this new stuff is just a layer on top of the old Windows. When the video started I had such high hopes that Microsoft was really going to do it this time. They were finally going to step up and do a Windows 95-esque type change to the PC computing world. Let me just mention one feature from the video and explain how I still see an issue with how they’re still thinking. The tiles have no consistency. Microsoft simply does not understand consistency. Sometimes the tiles are big. Sometimes they’re small. Sometimes they have a photo. Sometimes they have an icon (but that icon might be small, large, left, right, top, bottom, full-color, or white). Some tiles have text – but that text can be small, large, left, right, under an image, etc. Sometimes you can have 9 tiles to a screen sometimes you can have more. Some tiles are animated. Some of them are orange. I look at the screen as a whole and the first thing that I see is confusion. There is no consistency. I have to start reading each tile to see what it is for, what it does, and what it is telling me. This reminds me of so many changes that Microsoft labelled as “innovations” that forced me to re-learn my way around the computer. I know I personally didn’t find them innovative. I found the changes annoying. And I could name a lot of other people who did, too, but I won’t. I totally get that each person has their preference, which is why I said “I look at the screen…” instead of “Anybody who looks at that screen…”. But I feel that Microsoft is trying to catch up to Apple in all the wrong ways. In other words, I don’t think they’re realizing what truly matters. I think they’re overlooking it completely because they’re driven by what they *think* matters. It is so interesting to me that I just wrote “Microsoft is trying to catch up to Apple” just now. If this were 5 years ago, I would have said the exact opposite thing. Isn’t it remarkable what is possible in such a short time? A friend of mine posted the Windows 8 video on Facebook with the comment “Wondering why Apple pre-announced iOS 5? Wonder no more.” I actually disagree with that, for a couple of reasons. First, Windows already has so much more market share in the desktop and laptop PC world than Apple does that it’s not even a real comparison. Second, Apple has a mere fraction of the number of products that Microsoft does. 1. Introduce a new version of Windows that will sell a gazillion copies and keep the cash cow going – but won’t affect Apple at all. 2. Release something that barely, if even, stays current with competitors. I predict no significant change in market share over the next 5 years except to say that I bet Windows will have less then than it does now, by whatever the percentage. I say the following with the senior leadership at Microsoft in mind, not many of my friends who are brilliant, passionate, and wonderful people who work there. That said, the way I see it, it has become useless for Microsoft to simply do better than itself, because “itself” is stale. I reiterate what I’ve said several times over the past couple of years. It is time for new leadership at Microsoft. And I’m not only talking about Steve Ballmer. Last week Robert Scoble wrote a blog entry about MySpace’s “death spiral”. He said that he spoke with people involved, which he also referred to as “workers inside MySpace”. According to the article it all comes down to two things. Microsoft technologies and being in Los Angeles. I worked at MySpace for just under two years. Facebook hadn’t quite passed MySpace in reported number of registered users or traffic to the site when I left. My last day was two weeks before their first big round of layoffs. I don’t believe that MySpace’s “death spiral” occurred as a result of either Microsoft technologies or being in Los Angeles. And this comes from someone who frequently tweets frustrations about Microsoft products. While I was at MySpace I met and worked with some of the most brilliant developers I’ve ever met. Some might argue, “not brilliant enough”. That’s certainly a valid opinion, and I can understand why many people might think that way. But the way I see it, brilliant people often need good leadership just like every other human being. We wouldn’t be people if we had all the answers. Others show us new things and inspire us in many ways. We all strive to learn and do great things and do them well. Armed with the number of smart, willing people that MySpace was, I think they could have accomplished whatever they wanted. But leadership got in the way. Leadership that was focused on the wrong things, got complacent, and let the market move away from them. I realize that there was technical debt, and my friend Steve Smith, who supplied a great comment to Scoble’s article, explains the cost of that very well. He also mentions a few other things in his comment that ring very true. But if the task of reducing the technical debt or changing technologies was left to the brilliant minds that I worked with under the right leadership, MySpace would be in a very different (and I believe more successful) position today. I could take the time to name those that come to mind when I criticize the leadership, but suffice it to say that it straddles senior management like a horseshoe. It goes from the executive level straight to the product level. And that is, arguably, one of the major causes of the reversal of MySpace’s growth. Regarding Los Angeles, there are countless companies that get their start in this area. For that matter, there are lots of companies that start pretty much everywhere. Sure, Silicon Valley and Seattle have certain concentrations of technical talent, but that doesn’t mean that they have a monopoly on that talent. And I mean that from a technical, client, business, and sales perspective. MySpace didn’t fail because of a lack of technical talent or because it was in Los Angeles. 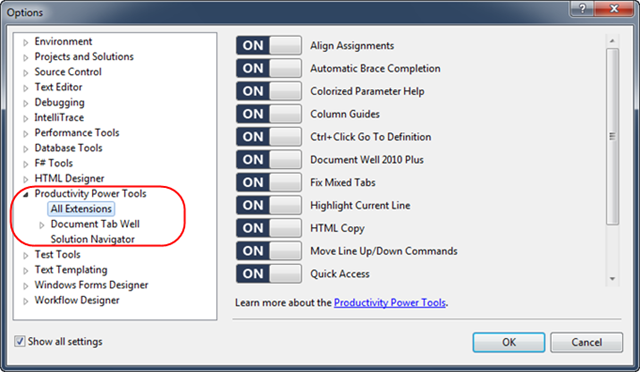 The Gu himself, Scott Guthrie of Microsoft, wrote a blog entry yesterday about some power productivity features that people can get with a new VS 2010 update. It only took me a few seconds to find two classic examples that clearly illustrate one of the things that frustrates me about Windows: There is no consistency. Don’t those “On / Off” switches look cool?? There’s just one problem. No where else in any of Windows do options have this interface for turning things on or off. People are used to checkboxes. There was nothing wrong with checkboxes. Everyone was used to them. So while this may LOOK cooler to some people, it’s different behavior. It copies the switches iOS now. But one reason they were made like that for iOS was because people weren’t going to be using mice – they would be using their finger, which is less precise. If you look at the little triangles, you will see that they point down when the node is expanded and they point to the right when the node is closed. But if you look back at the first screen shot, those triangles point to the lower right when the node is expanded, and appear all in black (there is no discoloration in the other window’s arrows). Furthermore, the arrows on the second screen shot are filled in gray. The ones in the first screen shot are gray outlines. Also, they’re different sizes. I’m not commenting on the particular features that Scott is writing about, I’m commenting on how there is so little attention paid to details like consistency. Call me nit-picky, go ahead. I deserve it. In a YouTube video posted by “WindowsPhone”, Microsoft claims that the mobile phone industry has hit a wall, and that each new smartphone that is released is only slightly better than the one before it. While this is being said, they show tons of smartphones including the iPhone. I think it’s important to be truthful here and say that if not for the iPhone being released 3 years ago, Microsoft never would have even started Windows Phone 7 Series. They would have just made insignificant improvements on their Windows Mobile platform just as they had done for the previous six years. So I have two main issues with this video. To claim that the iPhone is just a slightly better smartphone than the one that came before it is simply one of the most preposterous things I’ve ever heard. Even if you don’t like Apple or their products you still can’t deny the effect the iPhone had on the entire industry. It was at a virtual standstill until the iPhone came along. iPhone OS and Android are clearly setting the pace in today’s world. But 9 months from now when the first Windows Phone 7 Series hits the market (provided there are no delays) we’ll see just how much of an impact it makes. Interesting article from All Things Digital’s Kara Swisher. I don’t think Microsoft is capable of creating a mobile operating system that can compete with what’s out there, much less what WILL be out there in two years. They just don’t operate like that. Therefore, they should just do what they always do and BUY their market share by purchasing RIM. What would life be like without a cellular phone? Just consider that for a moment. You can’t make a call whenever you want. You can’t send a text message to anyone, or receive one. You can’t send or receive any email, either. Now consider that this extends in to your home and office. You have no computer. Think about that. You do not have a computer of any kind at home or at work. That means you have never sent or received a single email. You’ve only browsed the web once or twice from a friend’s house when you’ve been visiting. But browsing the Internet is pretty simple. All you have to do is click on things and read or watch. But you’ve never received a photo of your son, daughter or granddaughter who live on the opposite coast that was taken five minutes ago. You missed your granddaughter’s first steps because you didn’t get the email that went out to everyone else that had the link to the YouTube video. And because you live 35 miles from the nearest bookstore, you couldn’t browse the latest releases without conquering the snow and sleet. But let’s get back to having a computer. You don’t. So you have no idea how to use one. There are lots of examples of people who might fit this description. My mother is a mail carrier in a rural area. She’s never needed a computer. She’s never even really wanted one. She lives in a rural area and said that because of her location, $80 per month would be her monthly internet access bill (after paying $299 for equipment). I asked her “would $30 per month for unlimited traffic be an amount you’re comfortable with?” She said yes. She didn’t believe me and assured me that she had called all around to phone companies and satellite companies and cable companies and that $80 per month was the cheapest that she could get. So I put myself in her position and ignored everything I know about computers and imagined that someone put an iPad in front of me. They tell me that “Safari” means the Internet, but that’s all. I can see everything else (Mail, Contacts, Clock, Maps, Calendar, etc.) makes perfect sense. I’m told that all I have to do is reach out and touch the thing I want to do. That doesn’t seem likely, but I do it anyway. Suddenly the web appears. I see something I’m interested in so I reach out and touch it. All of this without any wires or keyboards. Something is strange – I’m online and there was no hassle. I’m instantly productive on the Internet. How can this be? I don’t even know how to use a computer. But somehow it’s just working. There’s no other machine and operating system in the world that offers anything even close to this kind of promise. And I will finally be able to email photos and video to my mother. As an attendee of Microsoft’s 2009 PDC conference I received a free Acer laptop with a touch screen that swivels around so instead of using it like a “clamshell” type laptop, you can also use it like a big thick clipboard, writing and tapping on the screen to accomplish your tasks. I appreciated this gesture from Microsoft. They are really trying very hard to shed the poor image they earned themselves over recent years. I haven’t had a Windows machine in the house for a number of years now. While I don’t need one, there are a couple of things I can think of to use it for. The first thing I wanted to play around with was the touch functionality. Not only can you use your finger to point at things, but it also comes with a stylus. Microsoft has been a huge proponent of “digital ink” – that is, using a pen-like device to write on the screen. They’ve been pushing this for years. It’s never really taken off in the consumer market, however. So, knowing that I’m grateful for the laptop and that I’m commenting on their touch functionality ONLY and not the laptop specifically, here’s what I think. As far as the consumer is concerned, Microsoft’s progress on the touch interface over the last several years has been virtually zero. You’ve likely seen the commercials about Windows 7 and the new touch screen computers you can buy from the big vendors. So while there’s more hardware support these days than there was a couple of years ago, as a user I don’t find any meaningful advances from Microsoft’s last six years in this area. I’m sure that there are lots of things Microsoft will say to try to get you to believe they’ve revolutionized touch on the laptop and desktop computer, but I’m just not seeing it when it comes to Windows usability. Sure, custom restaurant point of sale systems can (and do) benefit from the touch interface. But I’m not using those. I’m using Windows. And as for touch being a user interface for Windows, Microsoft is still a long, long way off. Take, for example, my new laptop’s ability to swivel the screen around 180 degrees so I can hold it like a clipboard and use the stylus. Well here’s the problem with that: when I hold it, my fingers wrap around the case and touch the screen, which totally screws up what Windows thinks my input is. I’ve tried to hold the thing differently, but I don’t want to drop it. I’ve also tried putting it down on the desk, but one of the things they haven’t accounted for is the fact that most people put their hand on their desk when they write on a piece of paper. Think about it. When was the last time you wrote a note to somebody while keeping your writing hand OFF the table? So rather than embrace writing, which is something almost everyone in the world does, what they’ve done is to force everyone to adapt the way they write in order to use digital ink. That strikes me as the complete opposite of how one would approach this. Can people re-learn how to write using Microsoft’s solution? Probably. Should they have to? No, I don’t think so. My opinion is that people should use things in a natural way. In other words, features aren’t features at all if people can’t (or don’t want to) use them. Next, I wanted to talk about the onscreen keyboard that you can opt to use when the laptop is in “tablet” mode. For some reason that completely escapes me, they’ve implemented this as a “tap one key at a time with the stylus” feature. What were they thinking? They simply moved “hunt and peck” to the touch screen. I tried typing on it, but it failed miserably because it’s not designed to accept more than one key every second or so. In addition, there isn’t any kind of logic involved with regard to typing with your fingers. For example, if I type the letter “q”, it naturally follows (based on the English language, in my case) that “u” is a likely follow-up. Unfortunately Microsoft didn’t take these kinds of things in to account. So I could type “qiestion” (over the course of 7 seconds or so) and Windows 7 does nothing at all to make logic out of that. In Word, it might highlight that as a spelling error, but it doesn’t preemptively correct these mistakes. The kicker is, there are already companies that do this. You don’t have to press the “BKSP” key to correct what you’ve done because if you just keep typing it will determine the work you had in mind. So there it is. A couple of my opinions about Microsoft’s touch work. I welcome comments, particularly those that tell me I’m wrong and if I just flip a switch everything works fine. I got an iPhone 3G almost a year ago and I got a two-year cell service contract with AT&T so I could get a deep discount. I’ve loved the phone, and will love it even more after I install the iPhone OS 3.0 software on it. Apple announced the iPhone 3GS at WWDC this week and some customers are throwing petitions around and complaining on their blogs and other web sites that AT&T should cut them a break and give them the discount normally reserved for those who have satisfied their contracts. I do not agree with these people. I think the iPhone 3GS just puts Apple even further ahead of every other smart phone on the market in the world today than they already were. Blackberry folks have (to a large extent) remained loyal, but Windows Mobile and other smart phone operating systems have, to put it bluntly, failed miserably in the face of real-life innovation and their plummeting market share proves this. I want the video camera. I want the digital compass. I want the faster 3G and the faster processor. But I should pay more because I haven’t satisfied my contract with AT&T. Once I have, over 12 months from now, there’ll likely be yet another new model on the horizon. So I’ll save my next discount for that one instead of whining and being greedy. This DOES NOT MEAN that I’m fond of AT&T. I feel their data pricing is criminally-high and their laziness to market with the new features is completely ridiculous. I should point out, though, that there are plenty of people out there who are still under contract who WILL pay the full, unsubsidized prices for the new 3GS. To these people I say bravo – enjoy your new phone!